It takes a lot of guts for someone of public stature to come out and speak about their experiences with UFO sightings. It takes even more guts to talk about your experiences with extraterrestrials. Sammy Hagar is one of these people who I greatly admire, not only for his music and selfless contributions to humanity but for his openness about his extraterrestrial contact. “I’m a firm believer – have seen, have felt, have been contacted 3 or 4 different times. I have received information that has been valuable in my life from those people, and they have used me. I’m gonna sound like a complete nut here, but they have used me in an experimental fashion. The easiest way to put it is that they downloaded my brain information. When I was about 19 or 20, they downloaded everything that was in my head. And I caught ’em doin’ it! I woke up in the middle of the night, thinking, ‘What’s goin’ on?’ They were like, ‘Oh, my god, he’s waking up!’ But this was all telepathy – there were no words being spoken. And as soon as I woke up – it was probably 3 o’clock in the morning – my whole room was so bright that I could hardly keep my eyes open. I was wide-awake, I could not move, eyes open, white room, they were still disconnecting – and when they did, it just went bang! Everything went back to normal, back to black. I was shaking, I almost passed out, I was sick to my stomach and almost had to throw up, it was so scary. It sent me on a course of curiosity. I bought a telescope, and I started reading UFO books, and I just got into the whole thing. And since then, there have been 3 or 4 other contacts with the same group of people. I don’t know who the f–k they are, but I’ve narrowed them down to a people called The Nine, who are called that because they’re from the Ninth Dimension. I’ve named my publishing company the Nine Music after them. Not only does Sammy have the guts to speak about his extraterrestrial contact, he even co-wrote a song about it! In 2009, I asked the Universe for ideas and suggestions. I received a “galactic download” that told me I needed to build a new spiritual website, write articles, make videos, start a radio show, etc… I was even given the name “In5D” during this download. You can read more about it here. I’ve seen thousands of UFO’s since I was a teen. Many of them are with my ATN Gen. 3 Night Vision Goggles . I have also experienced many visitations through the dream state as well as through channeling, so it’s not a coincidence that I can relate to Sammy’s story, music, and humanitarian aspects. He’s definitely a soul brother who came here to bring awareness that we are not alone! How many of us have experienced dreams about seeing UFOs or being aboard one? I have on both accounts and I’m sure many of our readers have as well. Many of us have received visions in the meditative state, too. 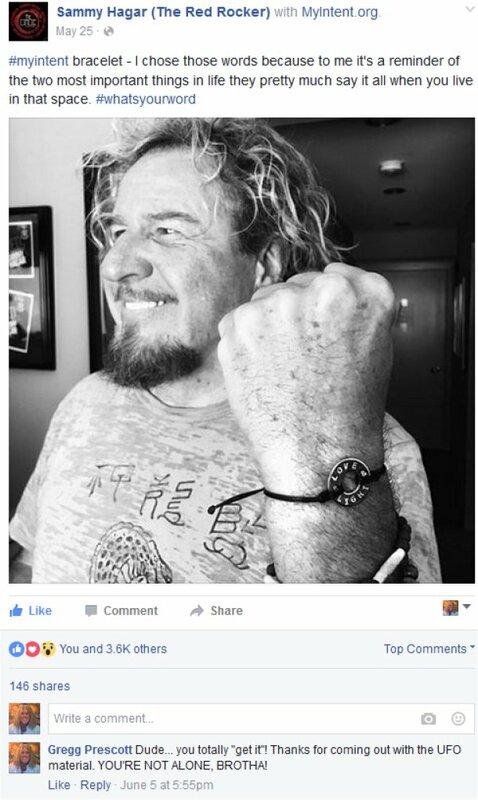 On Sammy’s Facebook page, there is a picture of him wearing a Love & Light bracelet. He stated, “#‎myintent‬ bracelet – I chose those words because to me it’s a reminder of the two most important things in life they pretty much say it all when you live in that space”. When you see this sign a life changing thought or event has just occurred. You may not like it, or you may. Whatever the case your Spirit Guides are notifying you that a change in your life path direction has just occurred and it is time for you to change too. Move with it, follow these thoughts. Drunvalo Melchizedek interpretation of 555: Unity Consciousness: This is the number when someone has attained Unity Consciousness. They have mastered all levels of the Mystery School. It is the highest number. It is the number of Christ. alternate 555 interpretation: Buckle your seat belts. A major life change is upon you. This change should not be viewed as being “positive” or “negative,” since all change is but a natural part of life’s flow. Perhaps this change is an answer to your prayers, so continue seeing and feeling yourself being at peace. The prevailing attitude of Atlanteans was that they were superior to the people of Mu for Mu was sinking. Lemurians found themselves traveling to Atlantis to escape. Amor found himself being a refugee in a land that was strange to him. Still he knew he had something important to do. Amor connected with those around him and tried very hard to make this new place feel like Home. His goal was to bring the love of Mu to Atlantis. For a time, it worked, for the magic was there. And the vibration of five moved forward. The fifth dimension was being created in the land of Atlantis . The 555 had begun. It was during this time that you chose to see lack and limitation. As the great influx of souls found refuge in Atlantis it strained the systems, for the technology was not in place to support the vast number of beings. Although you had the technology for rejuvenation, you thought that you did not have enough to go around, and rather than focus on what you did have, you placed your camera of perception in a place that said, “we do not have enough so we must devise a system to take care of those that we can take care of.” It was here that a class system developed in the days of Atlantis. It was here that a subtle expression of slavery came to your greatly”advanced” Planet of Free Choice. This misdirection of energy has come back to visit you many times during the Game. It was here that all the teachings of Mu, all the teachings of empowerment were lost in the blink of an eye. You felt that you had to decide who would use the technology and who would not. We tell you now that there was enough for all, had you only adopted the realization that everyone was playing important parts. Instead you chose to see some as more important than others. Here was the misdirection of energy that set into motion the fall of Atlantis. This was a time that you stepped into the fifth dimension. The effects of carrying misdirections into the fifth dimension are unrelenting. Amor worked to help people cleanse themselves so that they did not walk into the Temple of Rejuvenation carrying impurities. If only he had been able to keep you from walking into the fifth dimension carrying impure beliefs, Atlantis would be well today. I’ve been a big Sammy Hagar fan for many years and even named my German Shepherd after him. Someday, I’d love to interview Sammy in person or on In5D Radio, if I could ever figure out a way to contact him. I bet there’s a lot more he could say to fellow like-minded souls about his experience. One of the songs that put Sammy on the charts is called “I Can’t Drive 55”. In higher dimensions, I bet Sammy can’t fly 55 either… and neither can I! Have you experienced an extraterrestrial encounter? Have you seen UFO’s? Have you ever dreamed about seeing UFOs or being aboard one? If so, please comment below! Follow WooWooMedia.com on Facebook HERE! Gregg Prescott, M.S. is the founder and editor of In5D and BodyMindSoulSpirit as well as co-founder of WooWooMedia.com. He hosts a weekly spiritual show on In5D Radio and promotes spiritual, metaphysical and esoteric conferences in the United States through In5dEvents. His love and faith for humanity motivates him to work relentlessly in humanity’s best interests 12-15+ hours a day, 365 days a year. Please like and follow In5D on Facebook, BodyMindSoulSpirit on Facebook, as well as WooWoo Media on Facebook!